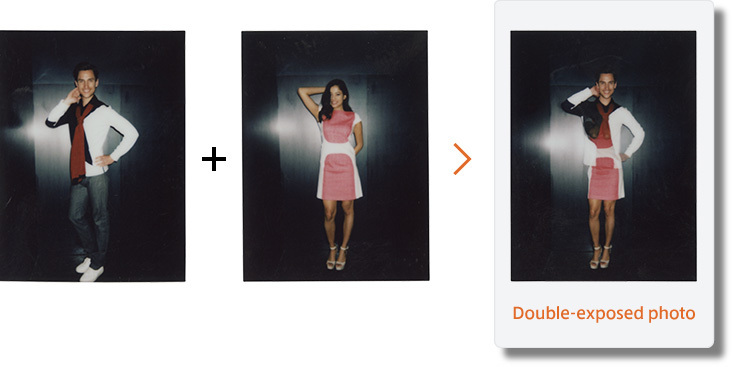 By releasing the shutter twice in the double exposure mode, you can superimpose two different images in a single photo. Enjoy adding an exquisitely artistic nuance, different from that created by normal digital processing. The double exposure mode of instax mini 90 is a new feature previous models do not have. In this mode, by releasing the shutter once for one scene and again for another, you can superimpose two different images to create a single creative photo. 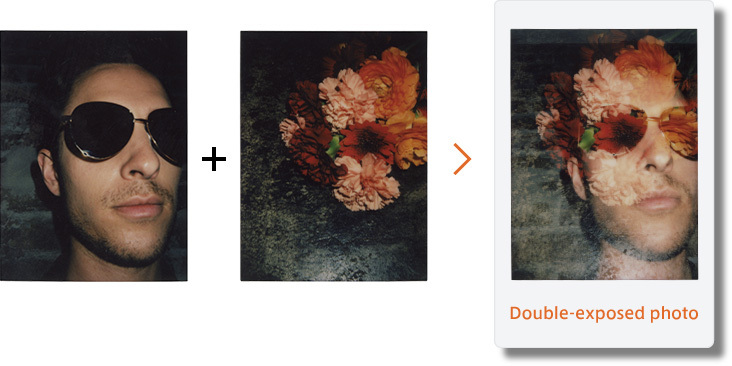 With the images of flowers (first image) and a man (second image), you can create a stylish photo of a man with blurry flowers. Enjoy the double exposure, following your inspiration. In the double exposure photo, the second image is likely to be seen on dark areas like shadows in the first image. To make a double exposure successful, consider if the image will have a dark area or on which part the second image should be superimposed before releasing the shutter for the first image. If taken in a bright place, the second image may barely be seen in the double-exposed photo. Select the D mode to make the tones darker so that the second image has more definition. By combining images of the same person in different compositions, you can even create a playful photo showing as if a person were holding a miniature of themselves. 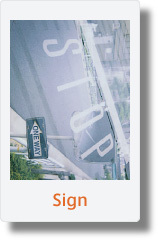 The road with a sign written is suitable for double exposure photography as the second image will appear on the asphalt. 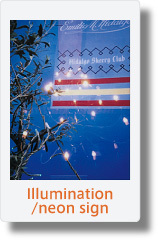 The light sources of illumination and neon signs can be seen clearly in a double- exposed photo. 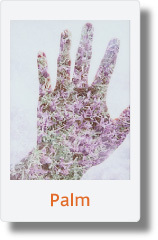 On the photo of a palm held against the sky, the second image can be beautifully placed. This technique is especially recommended to beginners of double exposure photography. Take the first photo while covering lower half of the lens with black tape and then the second one with the upper half of the lens covered in the double exposure mode. Unlike normal double-exposed photos having images overlapping each other, this method generates a photo showing two different images clearly in the upper and lower halves. It is also possible to create a diagonally split photo or left-right split photo. You can create an amusing trick photo, showing the upper body of a man and the lower body of a woman. It is recommended to use a tripod to make the background look seamless. A key to a successful double-exposed photo is to cover a slightly larger area than a half of the lens. Avoid covering the photometry part.